India’s cheapest Android Tablet PC Aakash has arrived. Kapil Sibal, Union Minister for HRD, Communications and IT unveiled the low price Tablet PC On October 5, 2011 at Vigyan Bhavan in New Delhi. 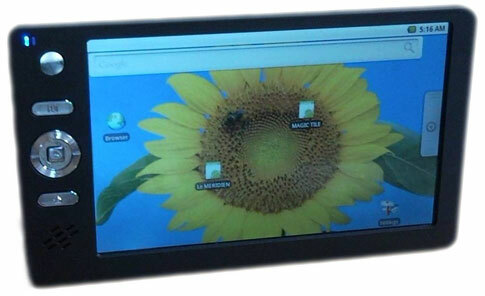 This android tablet pc is a concept of IIT Rajasthan, conceived by Canadian company Datawind. This device is currently not available for sale in the market as Government has decided to launch it for students in November 2011. The newly relased Aakash android 2.2 tablet pc supports multimedia content, Zip-Unzip feature, PDF Reader, SciLab, OpenOffice and a browser for social networking websites like Facebook and Myspace . For applications, the Aakash will have access to Getjar, a proprietary market, rather than the Android Market. The Government of India purchased 100,000 units of the device at $50 each and will be subsidizing it to sell it at the originally promised price of $35. The tablet is expected to be sold for $60 for retail consumers. The subsidized Aakash Tablets will be distributed in institutions by the HRD ministry. As a part of India’s National Mission for Education, Information and Communication Technology (NMEICT) 504 universities and 25,000 colleges countrywide would be the recipients of these tablet androids. This project was the outcome of experts coming together. The IT specialists came up with this idea at the Indian Institute of Science, Bangalore, IIT Kanpur, IIT Kharagpur, IIT Madras and IIT Bombay. It is being considered that these android 2.2 tablets would prove to be an asset for the students and will give them opportunity to excel in education. It is expected that Aakash is going to be the best android tablet in the android market. The Centre purports that these laptops would be offered at such a low price because they are a source of spreading literacy via technological methods. This mode of education would help create the awareness among the masses. The laptops are really going to see a huge drop in price. The project of launching this product is running successfully and it would be available to students, after five to six months. It is been reported that android tablet would be low in price but the final price of the product would be determined depending upon the transportation cost. The government gave away 500 tablet PCs to students from various states including Delhi, Rajasthan, Gujarat, Uttar Pradesh, Orissa and Tripura. Also these android 2.2 pcs were distributed to the students of the National Institute of Speech and Hearing, Kerala. The Indian government, however, plans to give 3,300 devices to each state during the first phase. The government is buying it for Rs. 2,500 per unit from Datawind but it is given away for Rs. 1,750 per unit. For the question what is a tablet pc, Aakah android 2.2 tablet pc is going to be the right answer. The Rs.1750 Laptop would be seeing a great deal of success and the expectations are already high that this would be popular. Very soon Aakash tablet will be listed among the top android tablets. The launching this laptop at this low price is seen as one of the major steps which would be taken to brighten the future of Indian students. •	It is enabled with a touch screen. •	An in-built keyboard is attached with this laptop. •	The laptop can store the data of up to 2 GB memory. It is a RAM memory. •	Wifi connectivity and USB port are this laptop’s additional features. Though, it is priced low, there may be some drawbacks such as this android pc may not be larger than normal laptop. The other drawback that the tablet has is that it does not have a hard disc. But, even this can be resolved as the add-on memory can be utilized in the laptop. Though, the computer lacks high capacity of memory but a user can take additional memories. 2 Response to "India releases world's cheapest Tablet PC Aakash at Rs 1750"
Go for the Ubislate 7, as it will work as a phone as well. You need to pre-order it online now. I've aldraey pre-ordered one for myself. I'm not sure if this is available in the retail market yet. It's expected to be out in the last week of January 2012. The battery? life is a concern though but getting such a device at such a low price is something that I can't let slip by!